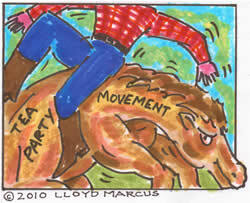 I also love the charge that the republicans are hijacking the movement. If the republicans are finally listening to the people and embracing our issues which are fiscal responsibility, less government intrusion and a strong national defense, I say, Hallelujah! But listen up republicans, you can not just talk the talk. You must walk the walk! Millions of Americans who have been passively watching our country slipping away for years are suddenly passionately seeking to restore it. So, frankly, I do not care that the movement is a bit wild and free.